You’ve likely heard tell of the fairy dusts employed by modernist chefs to create novel textures, amp up flavor, and just generally have a lot of fun with food. 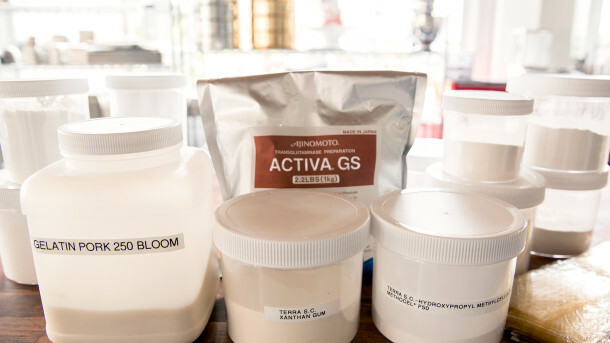 In fact, these powders aren’t storybook fodder at all—they’re developed in the service of food science. (And despite their high-tech origins, most are derived from natural ingredients). The stuff that makes Velveeta melt so winningly? 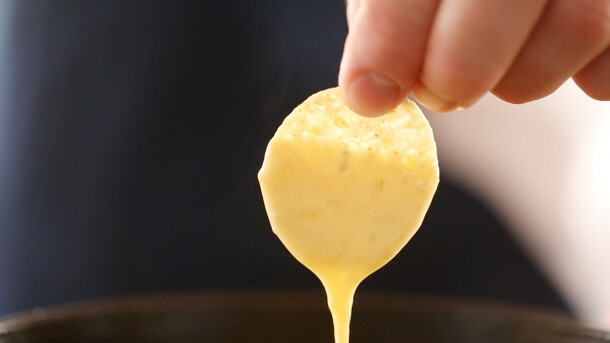 You can use that to transform any cheese into something equally gooey and delectable. The bonding powder developed to make artificial crab, meanwhile, can help you create an uncommonly well-textured beef roast. To begin playing with powders, check out these five ingredients—all available online and all essential to the modernist kitchen. Use them in our recipes and techniques, and you’ll see how they got their magical reputations. Xanthan gum is a food-thickening agent that’s common to bottled salad dressings and other condiments, including ketchup and the ever-so-popular Sriracha sauce made by Huy Fong Foods. 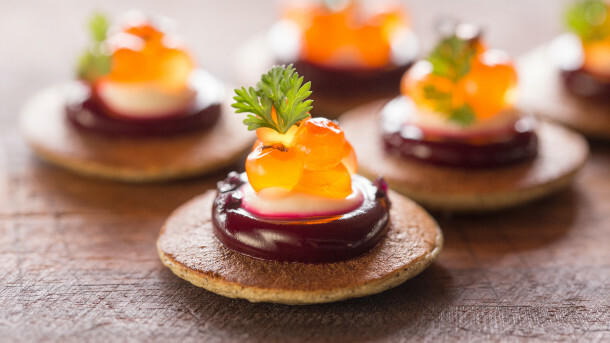 To create our Blini-topping Beet Fluid Gel, we used xanthan along with a hydrocolloid called low acyl gellan, which helps create a smooth, shiny product that envelops your tongue in bright beet flavor. (Psst: If you want to learn (a lot) more about hydrocolloids, enroll in our Fluid Gels class). You say you love baseball; we suspect you’re partly in it for the stadium nachos dipped in spicy, technicolor cheese sauce. The secret to the superior melty-ness you get with the processed stuff? Melting salts. A cornerstone of the commercial cheese world, salts such as sodium citrate, sodium hexametaphosphate, and sodium caseinate allow manufacturers to create sterile products that don’t “oil off”—an industry term that refers to the tendency of the fats in melting cheese to separate from the proteins. Tinker-prone chefs have taken advantage of melting salts to alter the texture of great cheeses, creating slices that have all the melty, creamy quality of the plastic-wrapped stuff you’ll find on supermarket shelves, but also the wonderful complex flavors of the best fromages. If you want to try the technique at home, make Nacho Cheese, Cheddar Cheese Sauce, or Melty Cheese Slices. Ah, meat glue—an unfortunate nickname that undersells the game-changing possibilities of Activa, also known as transglutaminase and capable of bonding proteins together to create glorious frankenfoods. First developed to make imitation crab, Activa can improve texture and flavor in everything from fish to fried chicken. But one of our favorite applications is this Reconstructed Roast—a killer technique for taking home-cooked beef to the next level. Everyone loves throwing shade on MSG—the sodium salt of glutamic acid that’s used as a flavor enhancer, primarily in Asian food. For the moment, we’ll leave it to Smithsonian magazine to dissect the veracity of MSG’s unseemly reputation, and just tell you that it can seriously up the umami factor in all sorts of stuff, offering a pop of flavor that can really level up a dish. 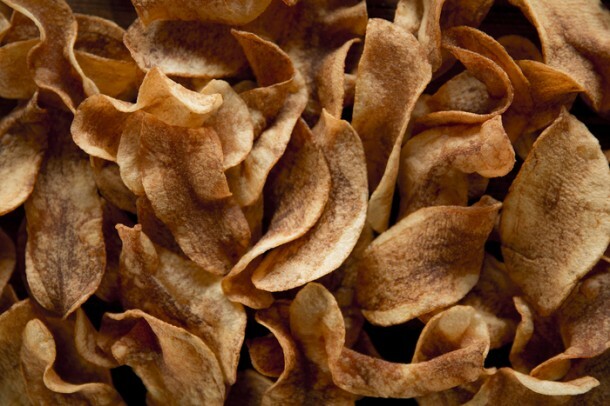 If you’re dubious, definitely don’t try it in our Potato Chips, a simple example of how MSG can be used to make a good food great. Love sour candies? Then you’re already a fan of citric acid, which lends a tart contrast to all sorts of sweet foods. 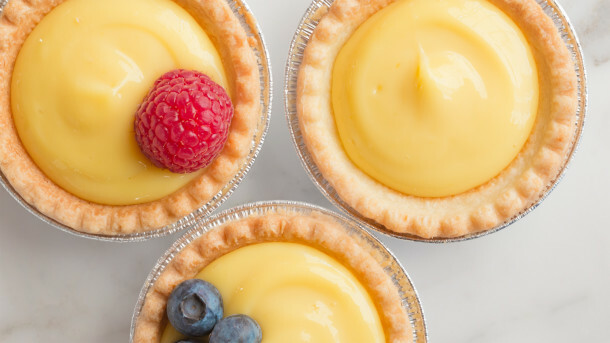 We sprinkle it into our bright Lemon Curd, a tasty topper to dishes both sweet and savory. Want to learn more about modernist cooking? Join the ChefSteps community today. Those look like some nifty plastic containers, where can one find those? Hi Stephen. Those are from Uline. I think uline sells only in bulk. Their per item prices are going to be cheaper, but ebottles.com is a good site for these types of containers if you want to buy in smaller quantities. Thanks for the suggestion, Bobby! Where is the best place to purchase all of these fabulous powders? I want more then the starter sizes I have been able to buy. Hey Jon. If you click on the links they should take you to a page with a link for where you can buy online! These are absolutely great starts. I would love to see a class or even just some information on Modified Starches. I can’t tell you how invaluable Ultrasperse-3 and Ultrasperse-M are. But it’d be great to see what the chemical and situational differences are between the two and even the difference between Ultrasperse and Ultratex. I am with you on this. A lot of times, I am intrigued by the possibilities and hobbled by my lack of understanding. I’ve used transglutaminase for making your Turkey Roulade, but I’ve also heard about food poisioning risks. While I generally find most anti-powder talk is hysteria from illinformed consumers (good luck with consuming no chemicals… start with holding your breath), can you give tips on storage? Is a ziplock bag in the freezer suffice or should I have vaccum sealed it? How long will it keep? And is the extra exposure to air (by not being vaccum sealed) simply affecting it’s ability to bond proteins or is this increasing safety risks. The food poisoning issue has nothing to do with the transglutamase, per se. The actual issue is essentially the same as why you’re advised to cook commercially available ground beef well-done. 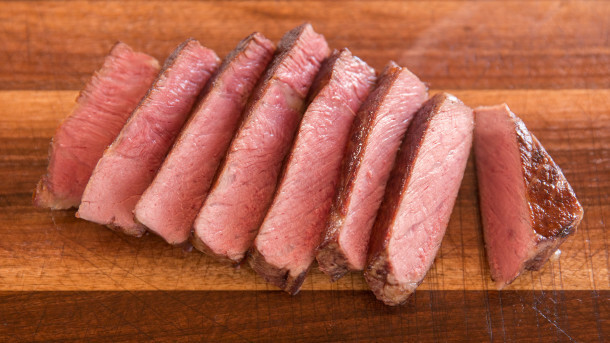 Meat glue can be used by unscrupulous vendors to create what look like whole-muscle cuts (steaks, roasts, etc. ), which would be generally considered safe to cook rare, when they’re really assembled from “parts is parts”, with the accompanying potential for bacterial contamination on the inside of the item. Therefore, you can potentially buy what you think is a nice steak or roast, cook it rare, and get food poisoning. Using it correctly in your own kitchen shouldn’t carry the same risk, although it’s good to keep in mind the potential issues. On a side note, I made the Turkey Roulade, too (along with several other items from “Best Thanksgiving Ever”). It was a hit! Msg is a bad ingredient! While it enhances the flavor of food it can cause everything to mouth and lip swelling, diarrhea and hives. I am still to leave it to the experts but what I am sure that here in ex Yugoslavia it heavily damaged the food culture in the period of the post WWII industrialization of the country. There is still in very wide use the mixture of dried vegetable powder and MSG that suffocated usage of traditional spices, cooking of the organic chicken and beef stock and the sense of taste is generally of very high tolerance with a lot of people. Average Yugoslavian born after the ’60 does not use things such as dill, cilantro, rosemary and does not find them interesting and tasty although those were regular in the food culture of the previous generations. I dont believe in powders. Back to the old school quisine. Naturel flavours, consistent, colors and more. A challenge for the Chefsteps team: can you create a nifty infographic like you did with the sous-vide map? Its great to see it being used here, on chefsteps. One issue I have is how difficult it is to get. Its not popular enough to be found in most commercial markets, or specialized ones, and its expensive/troublesome to get it online for a good few hundred grams. Plus, the mainstream media always like to talk about how harmful chemicals are, which are generally untrue. I would like to use a powder to prevent sugar mixture from becoming sticky and clumping. I have used potato starch which only works slightly. Any suggestions on the best selection, and and what ratio? Thank you! Here’s a good one that I haven’t been able to find any info on and I don’t seem to have much success with figuring it out on my own – sucrose esters. I ordered some with the hopes to adding it in my ice cream base when I use skim milk or a lite alternative to whole milk / heavy cream. From what i understand this would add that ‘full fat mouth texture’ to the lite version however the ratio and when exactly to add it is something that I haven’t figured out, let alone can find any info on. Any suggestions? I’d like to see CS do classes with “featured” esoteric ingredients and include enough of the stuff, sent to you, in the tuition fee. Maybe Modernist Pantry could sponsor a series of classes. Personally, I love the idea of a class including the esoteric ingredients most people would have to purchase online anyways (maybe as an upgrade option over regular price). Since where I live for me it is cheaper to order xanthan gum from China rather from US. Can I expect the same quality and the health safety? Hi! Thanks for the reply. Yes I am in Belgrade. I know I can get it fro Austria, thank you, but still the price difference remains.